New York: Software firm Microsoft Corp., seeking to revive the share price after a 29% slump this year, plans to buy back as much as $40 billion (Rs1.8 trillion) in stock, raise its dividend and issue its first commercial paper. Microsoft rose the most in almost a year in Nasdaq trading after adding a $2 billion commercial paper programme and saying it may ultimately sell as much as $6 billion in debt. Standard and Poor’s gave its highest possible credit rating to Microsoft, the first company to get the AAA rating in a decade. “The company’s strong credit quality coupled with investors’ current appetite for high quality paper provides a unique opportunity for the company to establish its first-ever commercial paper programme and enhance its capital structure," Treasurer George Zinn said in a statement. The biggest software maker said it has returned more than $115 billion to investors over the past five years in repurchases and dividends. The failed $47.5 billion bid for Yahoo Inc. drove down the stock this year and analysts including Heather Bellini predicted up to $20 billion in additional buy-backs. 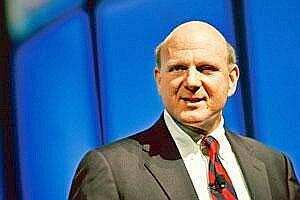 Microsoft gained as much as 4.6% at 9.39 am New York time in Nasdaq Stock Market trading, the most since October. The shares added 76 cents to $25.92 and earlier reached $26.32. Frank Shaw, a spokesman for Microsoft, declined to comment. Hewlett-Packard Co. also said on Monday it will buy back as much as $8 billion in shares, matching its largest repurchase.